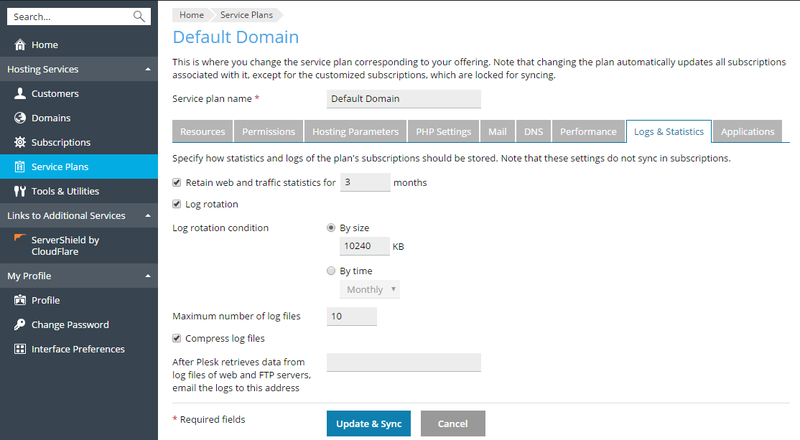 These parameters (located at Service Plans > select a plan > Logs & Statistics tab) define how statistics and logs of a subscription should be stored. Note: These settings in subscriptions are not synchronized with service plans. Sets a period (in months) for which reports on the subscription's web statistics (generated by the selected web statistics component) and traffic statistics (generated by Plesk) should be available. Note: The setting Retain web and traffic statistics is not changed in subscriptions when you update it for a service plan. The only way to update this setting for each domain is changing it in the Plesk database. See this KB article for more details. Enables automatic cleanup and recycling of web server log files. You can also switch on compression of processed log files and sending them to a specific email address.